What an awesome show! Even if your forte isn’t 1920s Delta Blues and ragtime, after listening to The Vaudevillian for a couple songs, I’m sure you’d dig them. That was the case last night at Jimmy Jazz, and I watched as patrons who weren’t going to their usual spots like DSTRCT, Frank ‘n’ Steins and Royal Electric because they were either full or weren’t hosting metal music, ridicule the concept that was displayed in front of them. After a few songs, feet were tapped, heads were nodded and even 2 girls began to have a great time after cutting the band no slack. Newly signed to Busted Flat Records, Norah, James and Piedmont have been living their music for a solid number of years, really perfecting their craft. I had the pleasure of interviewing them twice at CFRU on 93.3fm for Underplayed & Underpaid and got to know the group. Absolutely lovely folks. Norah and James (whom are now wed) even lived in New Orleans for a period of time to really soak in the weather and socio political climate left after their genre came and went. 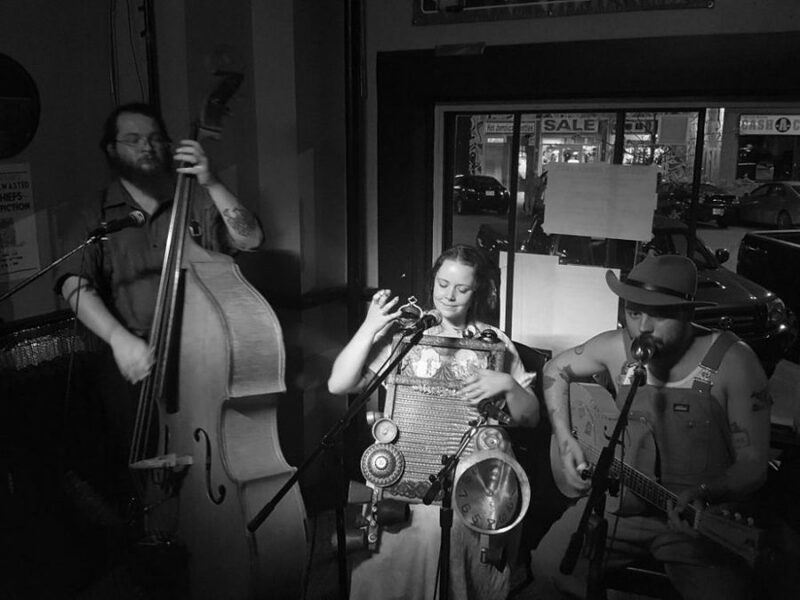 James leads with guitar and vocals, Piedmont slaps and raps on his upright bass and does the audio tweaking, and Norah plays a myriad of instruments like spoons, accordion, and her ever faithful frottoir. Check out their Bandcamp page for a taste of their music, and their Facebook page for bookings or to order copies of their new album!